We have been reading a spider book from the library that he has had great fun with. You can find it at your library or Spiders By Elise Gravel. During our craft we counted together how many eyes and legs. We observed spiders at the park. Watched them hang out in their webs, and noted the different kinds of webs there are. We have also been singing "Itsy Bitsy" as well as noting the letter that Spider starts with. 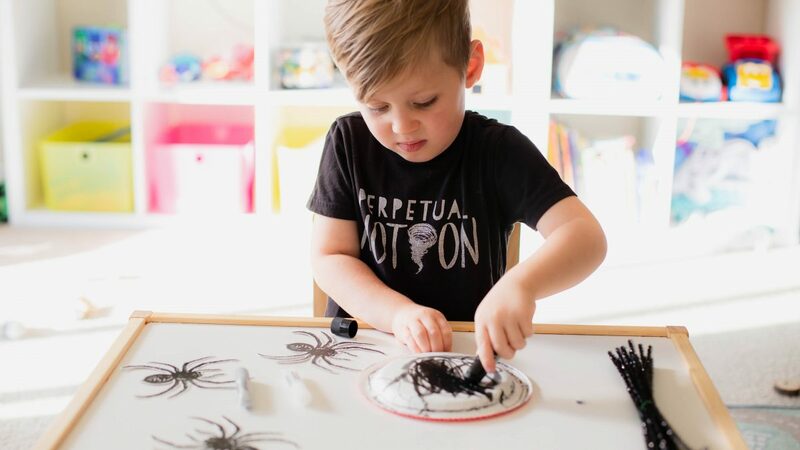 This is a super fun and simple craft that you can do with your preschooler. All of the supplies are easily switched out if you do not have them. This project was done specifically for our collaboration with Kwik Stix, and is easily one of our most favorite mess free ways to paint. Participating in crafts with my son also keeps me creative. Creativity is a muscle that needs to be exercised, and it wonderful in both children and adults. Creativity fosters critical thinking. Let your child paint on the back side of your paper plate. Don't worry about the edges because we will be cutting most of that off. Let your child peel and stick the googlie eyes. Some of the googlie eyes I had to help peel. Make sure to leave room for the very important fangs that eat bugs. Make sure there are 8 googlie eyes total. Cut the edges off your paper plate. Use a hole punch, and cut out 4 holes on each side. The shape of the hole punch doesn't even matter. You can also use a sharp pencil if you don't have a hole punch. Allow your child to string through the legs. Bend in half, and twist. Form little feet on the end. This is great fine motor practice. Note: My son had a hard time trying to twist the legs once they were bent in half. 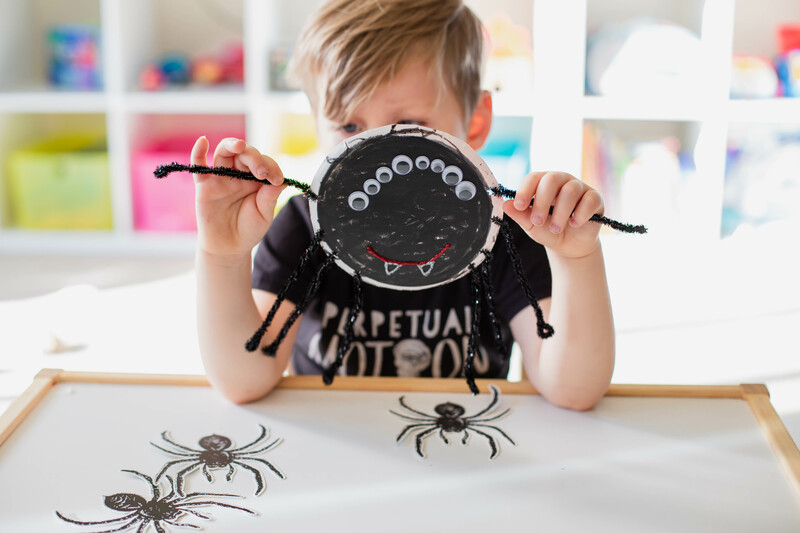 Let your child admire their fine handy work with their spider so far before you add the glitter glue smile and fangs. They take a while to dry even with a hair dryer.